Believe it or not, there was a time when Microsoft dominated and everybody else hated them (only half of which is true now). The Internet in its role as Great Disruptor helped turn that all around, starting in the late 1990s. As Netscape, Apple, and other companies were using the Internet to move forward, Microsoft was working on how it could own the Internet like it owned personal computing. In the middle of all that, I ended up working on Mac stuff at Microsoft with a ragtag band of Apple refugees deep in the heart of Silicon Valley. 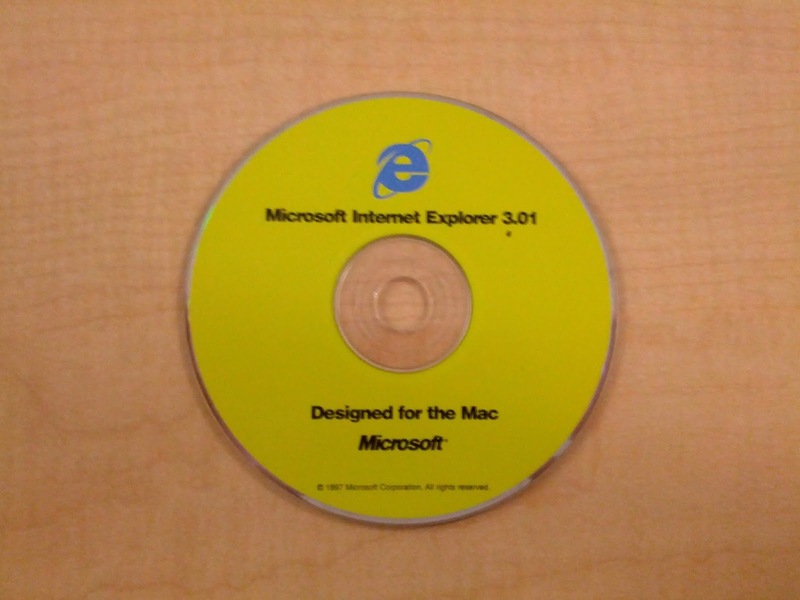 These folks built Internet Explorer for Macintosh. It was hand-crafted for Mac OS, by experienced Mac developers, and supported virtually every important native Mac technology, unlike Netscape, which looked and worked a lot like its Windows version and was (I assume) the product of a cross-platform development strategy. Oh, the irony. What amazing packaging we had back then. N.B. "Designed for the Mac". Guy laughed. Nobody else did. The keynote moved along. Although I'd been to almost every Macworld Expo, I never really noticed the Microsoft presence before. Now I was about to find out what that was like (spoiler alert: it's not awesome). Our booth was essentially empty all the time. People used it as a shortcut to avoid the busy aisles around the jam-packed Apple and Adobe booths. As they walked through they sometimes muttered darkly about Microsoft, or chuckled at how empty the booth was. 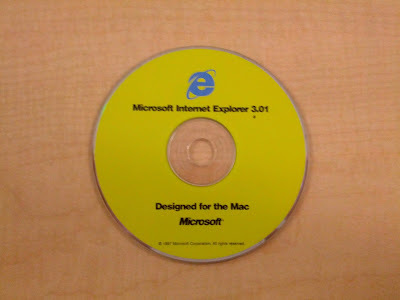 One guy who actually stopped in the booth looked at the stack of IE CDs (yes, as depicted above, companies really used to give out software on CD, even web browsers; downloads at 56K took a long time) and started picking up a few copies. I walked over and said he must have tried and liked IE, because he was taking copies for his friends. He grinned and replied no, he would never use our goddamn software, but he liked to put the CDs in his microwave and watch them crackle. I just nodded and backed away. On the last day of the expo, I did an interview with KCBS radio in San Francisco. They asked the important question: what in the world was Microsoft doing at Macworld? As I explained that we were a Mac-loving bunch who had created and were giving away a really good web browser for free, I heard laughter behind me and the reporter cryptically said that the Apple – Microsoft "rivalry" appeared to still be going strong. It turns out that during the interview, people behind me were making all sorts of fun gestures including rabbit ears, throat-slits, and middle fingers.